This book feels like it's written for a YA audience, but the very subject matter: a princess! And her loyal pegasus! are certain to have appeal to a younger crowd as well. I was entranced by the cover, with that majestic pegasus swooping down and the promise of a high fantasy magical medieval type of setting. This book certainly did not disappoint on that score. 12-year old Princess Sylvi is set to be pledged to her pegasus, Ebon, in a traditional ceremony that keeps the peace between the two nations. Everyone is amazed when she somehow manages to break the communication barrier by speaking telepathically to her counterpart, a feat that has never-before been achieved. The "grass is always greener" aspect of the story played very well. The humans, of course, are jealous of the pegasi ability to fly, their regal equine beauty and superior skill in the magic arts. Pegasi are envious of humans' hardiness, their ability to effectively wage wars and of course, their strong hands capable of grasping and tool-making. For generations, the two species have had a strong alliance. The humans live in the rich valley lands, protecting the borders from dragon-like beings and other hostile creatures. The pegasi, who have the earlier claim to the land, keep to themselves on the plateaus and occasionally gift the humans with finely wrought pegasi goods. To keep their diplomatic relations strong, they pledge to be bound to each other in a ceremony where they refer to each other as "most excellent friend." Despite centuries of trying, there still isn't a perfect communication system between the two species. They can manage a bit of sign language to get across crude ideas. When an important occassion really calls for it, they can laboriously attempt to speak a few words in the difficult to reproduce sound of the other's language, but that's about it, really. There is something mildly ominous in the human/pegasi inability to communicate. A few of the characters briefly puzzle over it... after years of study, each species still finds itself forgetting hard-won vocabulary as soon as it's committed to memory. The one thing that really bothered me about the book is that the pegasi DO have hands... weak, tiny spindly fingers on the pinions of their wings. The idea of a gorgeous race of pegasi with creepy little claw hands on their wings grossed me out. I wished so much that they didn't have hands at all! Any work they needed to do that couldn't be done with hooves, wings or mouth, could have been accomplished with a mild telekinesis that leaves the pegasi weary and unable to do much. Because she's young and doesn't know any better, Sylvi breaks a lot of taboos, for example, touching her pegasus, when such contact is forbidden. Eventually, of course, she even sneaks out to ride her pegasus at night. The story takes place over many years, with Sylvi and Ebon growing ever more devoted to each other. Obviously, a romance between them is impossible, as their species are so different, and yet, there's an odd frisson between the two, with Ebon's family growing concerned when Sylvi visits the pegasi homelands (a first for humans!) and they see firsthand how inseparable the two truly are. I liked Sylvi's warrior mom - a bit unsuited for royal life, her's was a political alliance, but the relationship between the queen and her daughter was quite nice. If this review doesn't cover much of the plot, that's because there isn't one. This is more of an atmospheric book that leans heavily on the hook, "OMG, best friends with an awesome pegasus!" Still, it was an enjoyable read for all the hints that it lays down: Why haven't the species been able to communicate until now? What's going on with the human magicians? Why have other monsters started encroaching on human lands again? What's going on outside of the wonderful little protected dell of Sylvi's kingdom? The book ends rather abruptly with Sylvi distraught at being separated from her beloved pegasus. Her father has commanded her to give up this pegasus nonsense and get to the serious business of helping to run the kingdom. Meanwhile, Sylvi pines for Ebon like an addict removed from their drug of choice. Will there be more books set in this world? The door is certainly open - as a stand-alone the ending leaves a bit to be desired. 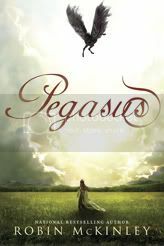 I'll recommend this book to fantasy lovers, and to girls who love horse stories. I read Robin McKinley's blog, and she suffered great angst at the hands of Pegasus before splitting it in to two books....I do think that there should have been a note at the back saying To Be Continued...it's not as if the publisher didn't know. That sounds fascinating... I'll have to check out her blog. Thanks for the tip, Charlotte.